18 holes, par 73, 7433 yards. Parkland. Set in a stunning woodland area a stone’s throw from Cardiff, this brilliant championship golf course is a great mix of wide and narrow fairways, sloping greens and exciting doglegs, with the ever present danger of water hazards and sand traps. Measuring in at over 7,400 yards, The Wales National Course at The Vale Resort is one of the longest golf courses outside of the US. 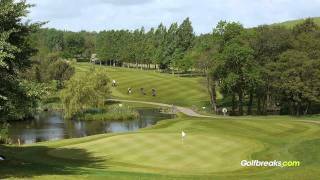 In addition to its many fine course attributes, The Wales National has played host to the Euro-pro and Challenge Tour events, as well as the FIRSTPLUS Wales Open in 2006. Whilst only being manufactured in 2004, this beautiful parkland course has developed into one of the more special courses in southern Wales, and it is perfect for anyone looking at a golf vacation in the local area. We advise that you take your handicap certificate just in case you get asked on arrival. Golf carts are available from the golf shop for £25 per cart - pull trolleys and electric trolleys are also available at a lower price.